Using data from 20 even-aged and homogeneous mature beech and oak study plots in Flanders (Northern Belgium), an analysis of the empirical relationships between the rates of leaf area index (LAI) change throughout the leaf development of 2008 and stand, site and meteorological variables was performed. Species-specific multiple linear regressions were fitted between the rates of LAI change and the predictors for two distinct periods from April until August. After a sharp increase in LAI following budburst, the seasonal LAI development for both species showed a marked period of stationary LAI development over all study plots. The cause for the cessation of LAI growth was assumed to be the decline of air temperature and radiation during this period. Later on, the rate of LAI development restarted similarly in every plot. The influence of weather on LAI development was high and its effects were different between species, with beech mostly affected by radiation and oak negatively related to minimal and maximal values of air temperature. Furthermore, our analysis suggested that stand structural (tree density and stand basal area for both species) and tree growth characteristics (average tree-ring width ratio for oak) variables were major drivers of the LAI development during early spring. Later during the growth period, stand variables became less predominant in affecting LAI development. Site quality variables affected LAI development to a lesser extent. The seasonal LAI development was found very similar among stands. 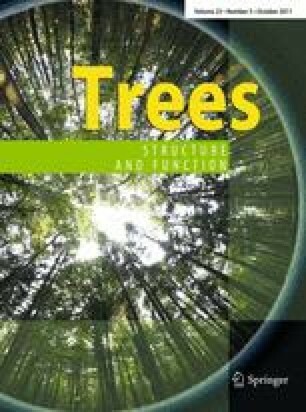 This study adds a more accurate and comprehensive approach to the modelling of LAI development during leaf growth of two important European temperate deciduous forest species. Our thanks go to the Royal Belgian Meteorological Institute (KMI) and the Royal Dutch Meteorological Institute (KNMI) for providing meteorological data and the forestry offices of the Flemish Agency of Nature and Forest (ANB) for granting access to the study plots. Furthermore, we thank the Flemish Institute of Forest and Nature Research (INBO), as well as to all colleagues and technical staff of the SimForTree project. This research was supported by the SimForTree research contract of the Flemish Institute for the Promotion of Innovation by Science and Technology (IWT contract number 060032).